The present study highlights the rich species diversity of higher plants in the Bhabha Valley of western Himalaya in India. The analysis of species diversity revealed that a total of 313 species of higher plants inhabit the valley with a characteristic of moist alpine shrub vegetation. The herbaceous life forms dominate and increase with increasing altitude. The major representations are from the families Asteraceae, Rosaceae, Lamiaceae and Poaceae, suggesting thereby the alpine meadow nature of the study area. 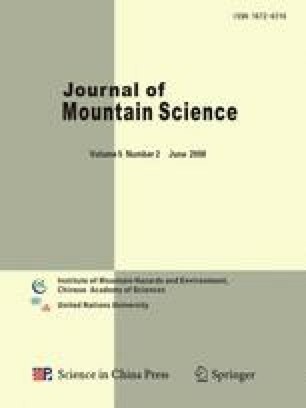 The effect of altitude on species diversity displays a hump-shaped curve which may be attributed to increase in habitat diversity at the median ranges and relatively less habitat diversity at higher altitudes. The anthropogenic pressure at lower altitudes results in low plant diversity towards the bottom of the valley with most of the species being exotic in nature. Though the plant diversity is less at higher altitudinal ranges, the uniqueness is relatively high with high species replacement rates. More than 90 % of variability in the species diversity could be explained using appropriate quantitative and statistical analysis along the altitudinal gradient. The valley harbours 18 threatened and 41 endemic species, most of which occur at higher altitudinal gradients due to habitat specificity.